As promised last week here are a few more pictures of our eating out experiences at ImmAim Vegetarian Cafe in Chiang Mai. 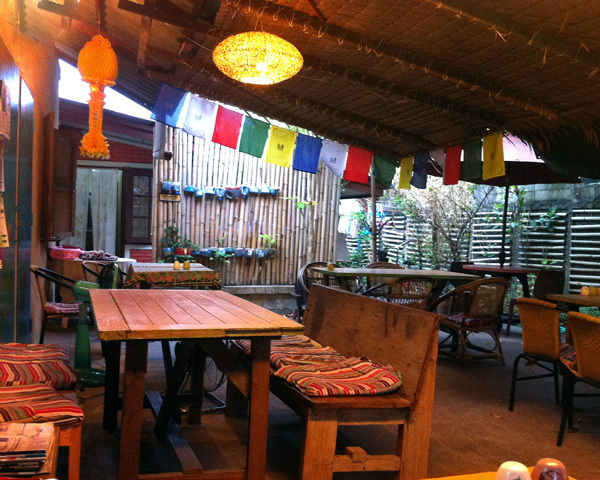 We discovered this lovely restaurant only towards the end of our stay in Chiang Mai. Nonetheless, we came here twice and would have come more often if time had allowed. ImmAim is located in an open garden/backyard setting covered by a straw roof. The wooden and wicker furniture with colorful cushions make for a cozy and comfortable atmosphere. The kitchen is located inside a building on the left of this picture. There is also a small shop there selling fair-trade and organic products. Quote on the menu at Imm Aim. What an inspiring way to think about food and eating. On our first visit for dinner I had this great Pineapple Fried Brown Rice. 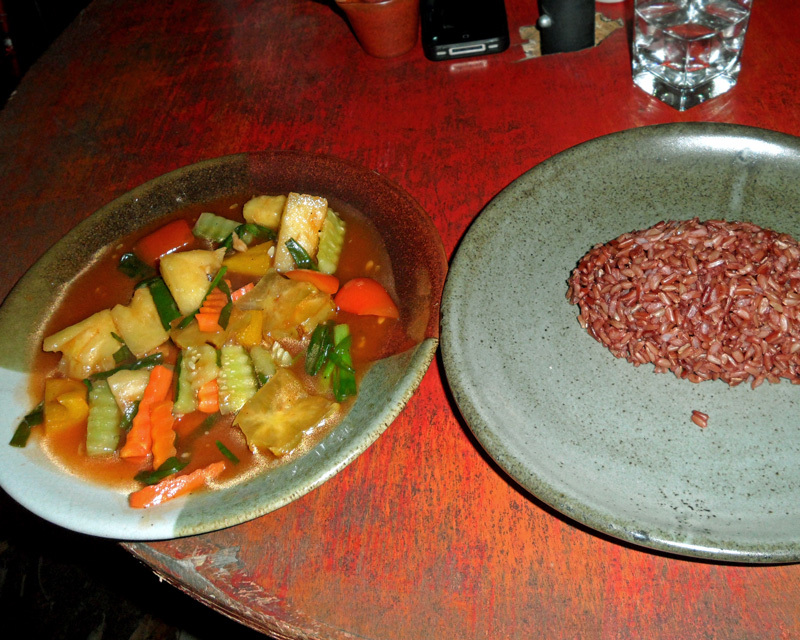 We came to love this variety of brown rice during our stay on Bali last year. It has a heartier, chewier texture. All fried rice dishes here are served with a small bowl of vegetable soup and a generous portion of salad/fresh vegetables. 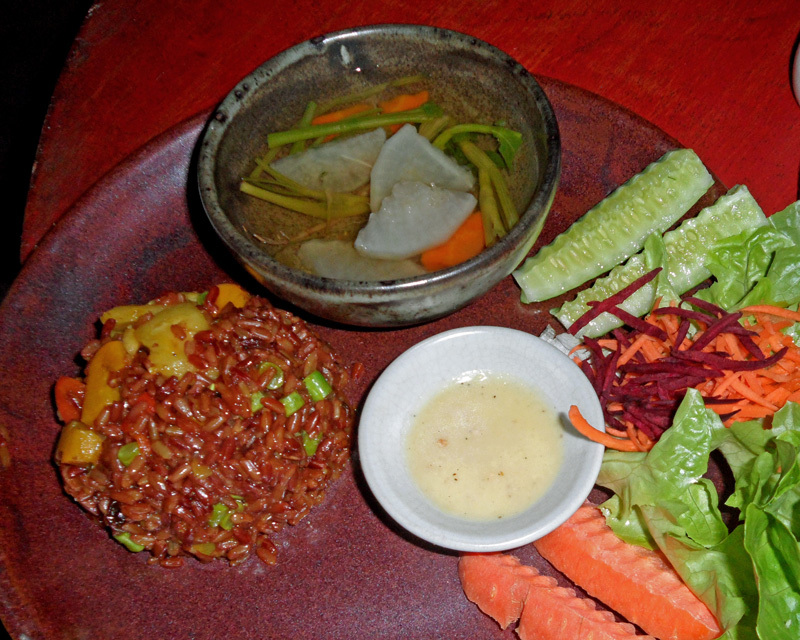 Konrad had a stir-fried vegetable dish that was served with steamed brown rice. This delicious stir-fry had an exotic flair with pineapple chunks and starfruit slices. Another item that absolutely deserves mentioning is this amazing Passionfruit Ginger Lime Tea. 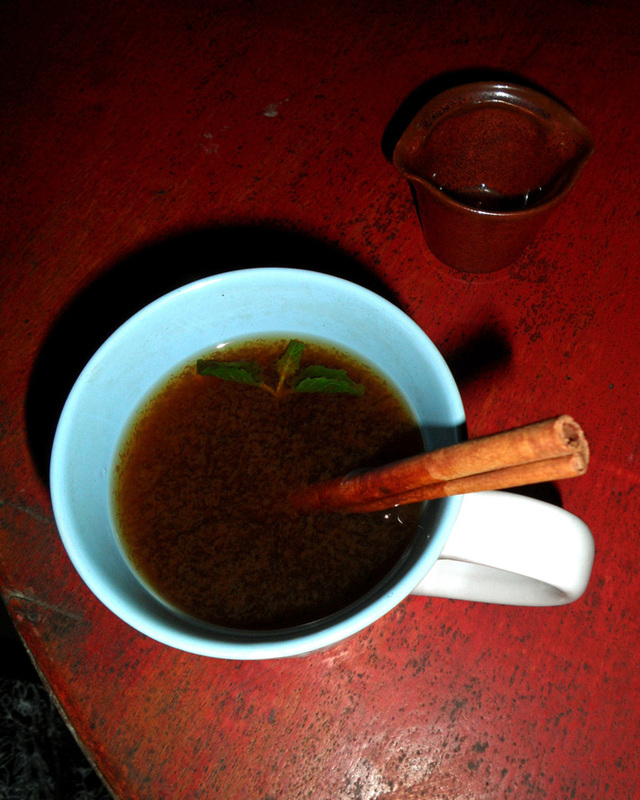 It was served with fresh mint, honey and a cinnamon stick for stirring. I fell in love with this tea! Although it as hot, it was refreshing at the same time. 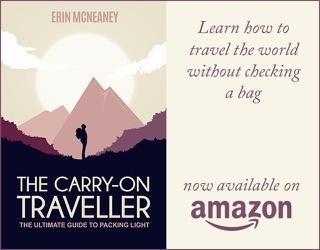 Definitely give it a try if you visit. Our second visit was more of a late lunch/early supper so we tried some of the snack and appetizer food from the menu. 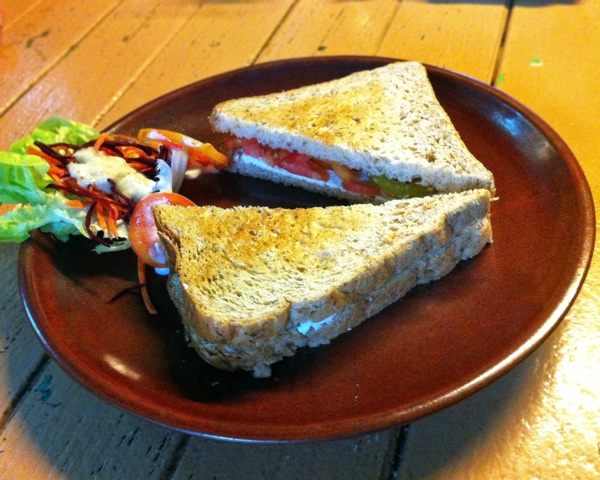 Konrad chose a Cream Cheese Tomato Brown Bread Sandwich. I think it was the first time that I saw cream cheese on a menu in Thailand. According to the restaurant it is homemade by the restaurant. 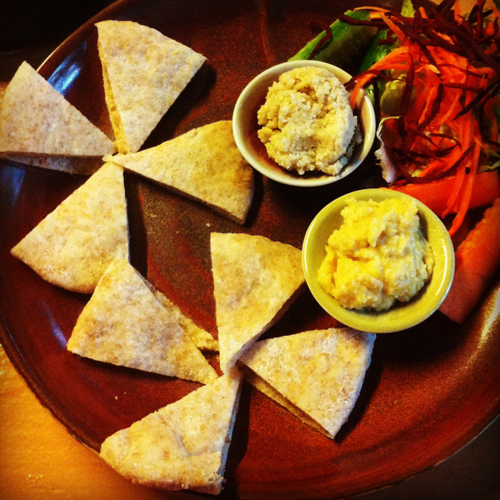 This is an Instagram shot of my Hummus and Tahini Pita Bread platter. Unlike Arabic/Middle Eastern Tahini Eastern Asian Tahini is made from unhulled sesame seeds and is therefore much grainier . This platter was also served with salad and carrot + cucumber sticks. 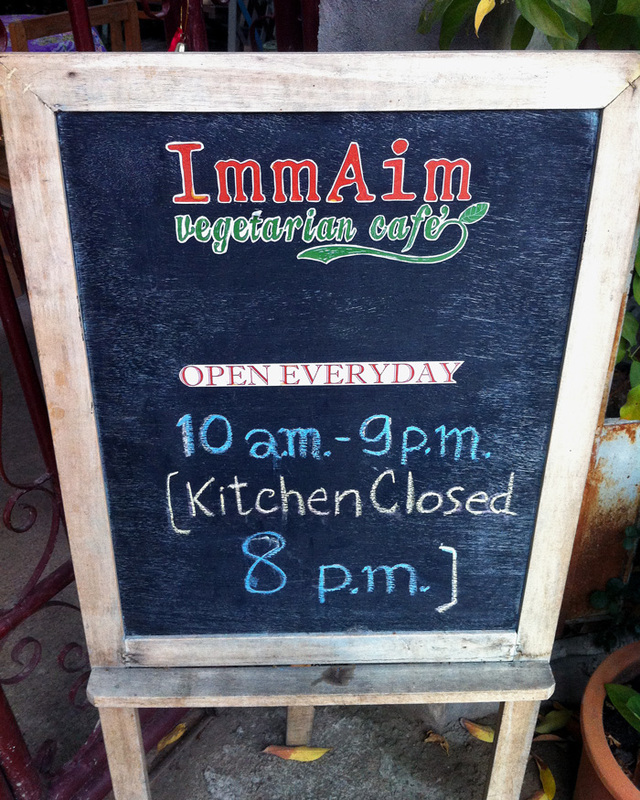 We really enjoyed the healthy food at ImmAim and were surprised how reasonable their prices are. Most meals are between $2-3 and they provide big glasses of drinking water without charge. So if you make it to Chiang Mai consider getting your healthy food fix here or at Pun Pun – their other location serving more Asian style vegetarian food within the temple grounds of Wat Suan Dok. Unfortunately, we never had a chance to go to Pun Pun before we left for Vietnam but it is definitely on our to-do list for another Chiang Mai visit. « Photo of the Week: We are in Vietnam! Love, love, love Thai food. And it’s so veggie friendly. The pineapple brown fried rice looks very interesting. 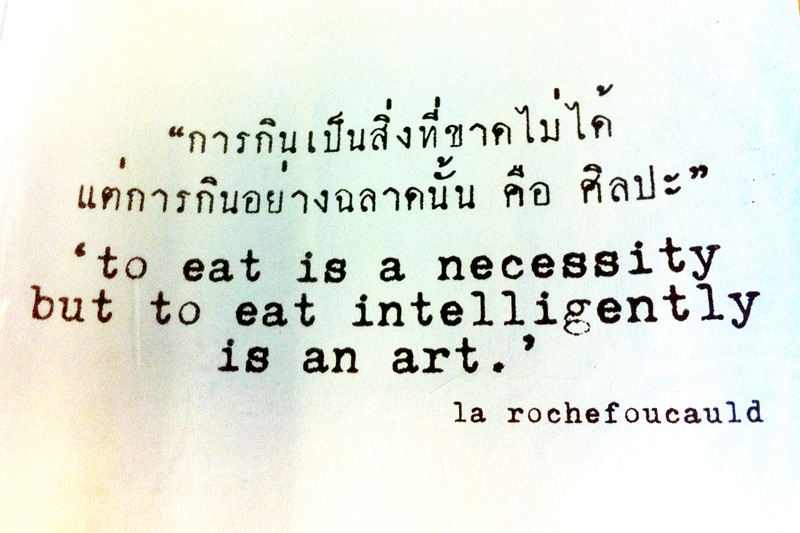 Totally share your love of Thai food! Looks fantastic, I would definitely stop by.